Austrian journalist; born in Raudnitz, Bohemia, May 30, 1849; died in Berlin Jan. 23, 1899. Schiff was the son of a petty merchant, and became a pupil at the Jewish public school in his native town and at the German gymnasium in Leitmeritz. Subsequently he studied law at Vienna University. In 1871 he became a political writer on the Vienna "Deutsche Zeitung," in which position he was one of the first journalists to champion Dr. Schliemann, the genuineness of whose discoveries was not at that time generally accepted. 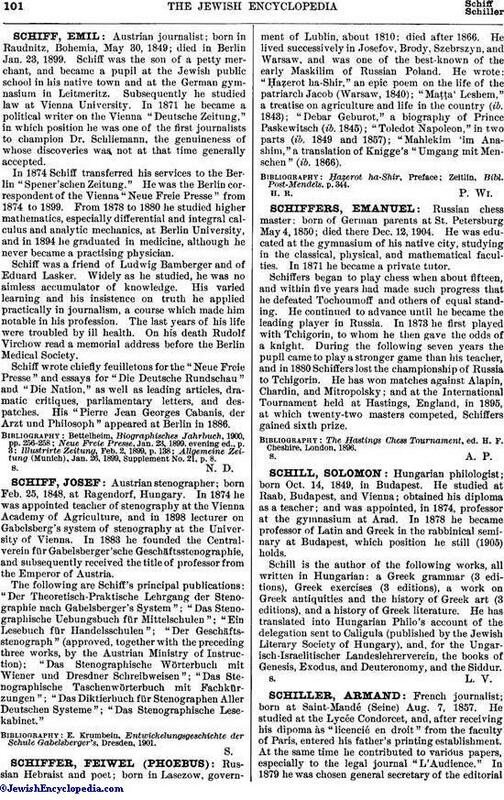 In 1874 Schiff transferred his services to the Berlin "Spener'schen Zeitung." He was the Berlin correspondent of the Vienna "Neue Freie Presse" from 1874 to 1899. From 1878 to 1880 he studied higher mathematics, especially differential and integral calculus and analytic mechanics, at Berlin University, and in 1894 he graduated in medicine, although he never became a practising physician. Schiff was a friend of Ludwig Bamberger and of Eduard Lasker. Widely as he studied, he was no aimless accumulator of knowledge. His varied learning and his insistence on truth he applied practically in journalism, a course which made him notable in his profession. The last years of his life were troubled by ill health. On his death Rudolf Virchow read a memorial address before the Berlin Medical Society. Schiff wrote chiefly feuilletons for the "Neue Freie Presse" and essays for "Die Deutsche Rundschau" and "Die Nation," as well as leading articles, dramatic critiques, parliamentary letters, and despatches. His "Pierre Jean Georges Cabanis, der Arzt und Philosoph" appeared at Berlin in 1886. Allgemeine Zeitung (Munich), Jan. 26, 1899, Supplement No. 21, p. 8.